Just a quick howdy to wish you a Happy Easter and to check on how everybody is coming along after a couple of nights of hard-partying. Is anybody still standing? 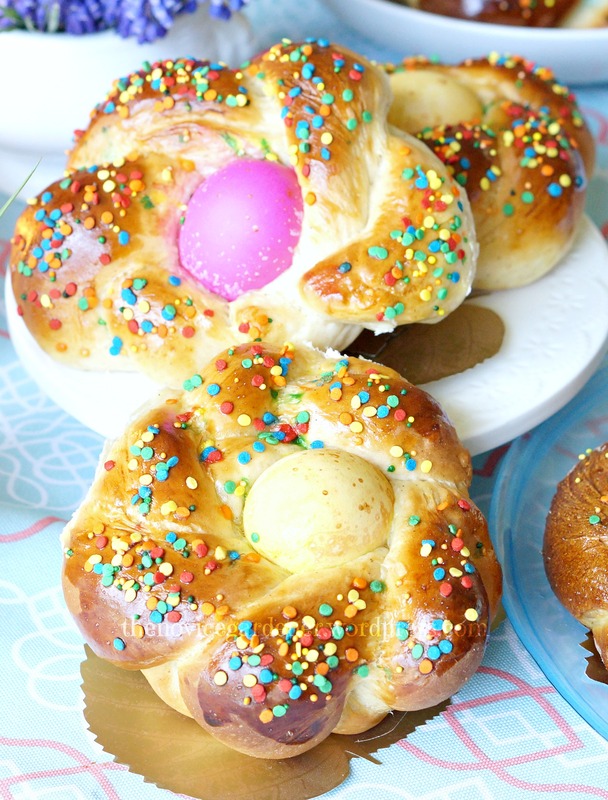 For those of you who decided to stick around, there’s Easter bread on the dining table. Please help yourself! Oh, by the way, did you see the table I set up for you, complete with candles all lit? I thought maybe fire would further fuel excitement for the party. 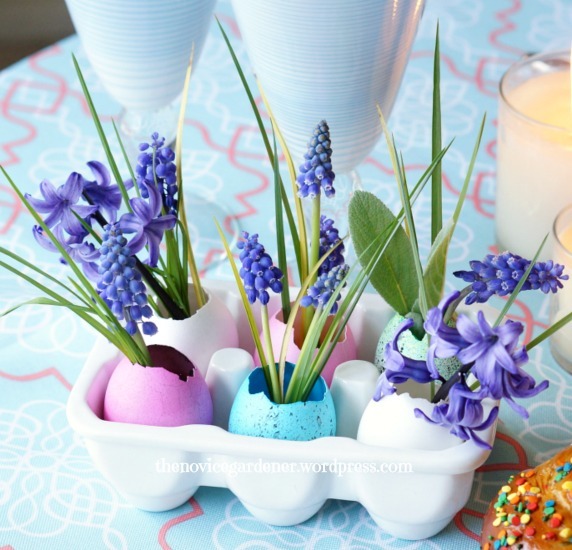 And what do you think of this cute centerpiece idea, using eggshells, I borrowed from Martha Stewart? 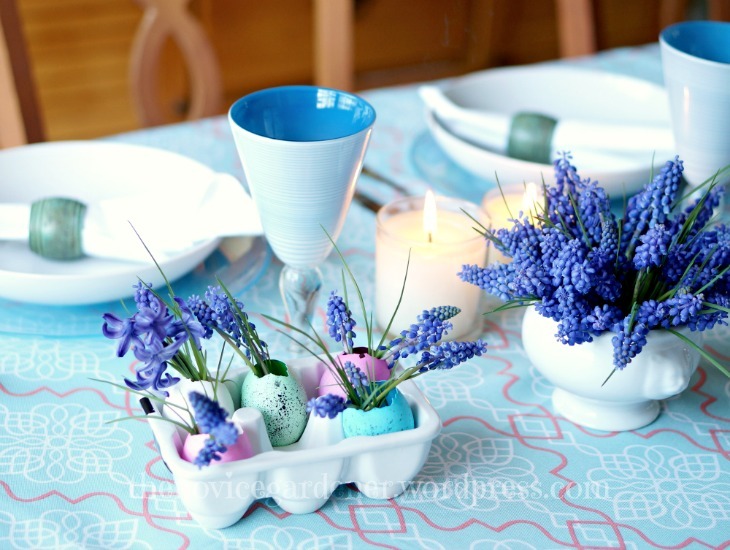 Someone aka Sir Johnny had noticed and liked that I used Muscari to decorate the table with, so here is another shot of the pretty flowers. If you are thinking of planting them, however, The Frustrated Gardener (Who isn’t?) 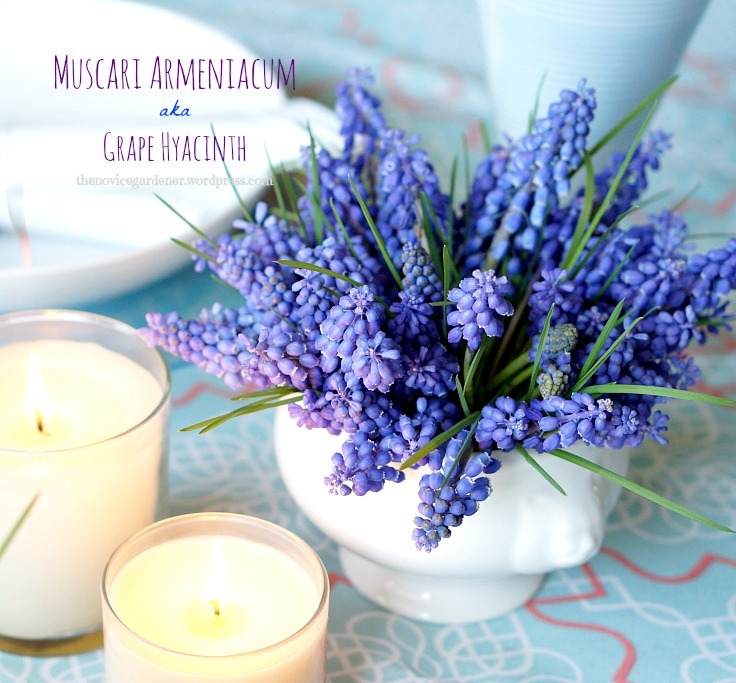 suggests you go with Muscari Aucheri instead of Muscari Armeniacum. The latter is what I have all over my garden. And I mean, all over! They romp and spread too freely for my liking. I will have to dig out the ones in the lawn one at a time, by hand. There’s no other way of getting rid of them. The few that had migrated to the neighbor’s lawn, I’m not doing anything about. He gives me bamboo, so I return the favor. Trust me, I’m being much kinder with my Muscari than he is with his bamboo. Recipe for the bread coming soon. Like tomorrow. Maybe. Promise it’ll be here, though. Eventually. 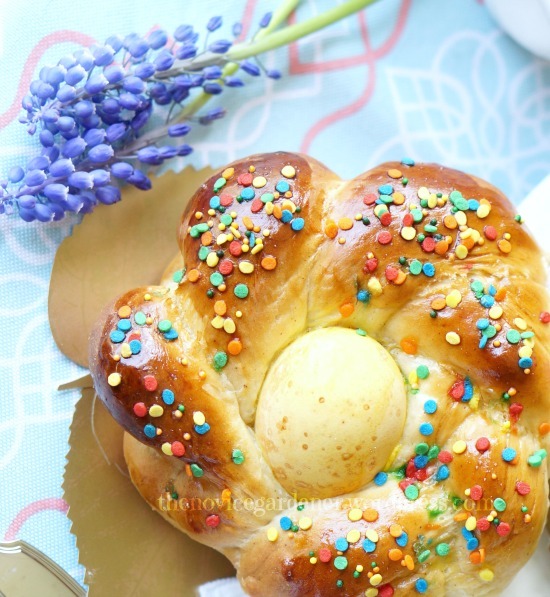 Hope you had a wonderful Easter. Love the eggshell idea, very clever. Beautiful Muscari, I am picturing a lovely bed of blue as far as the eye can see, unfortunately the deer ate most if not all the flowers on mine, need to figure out a way to protect them, ah well next year.. Your center piece is absolutely adorable!! I wish I had gone to your house for dinner! That bread looks divine! This was so beautiful with the grape hyacinths and such delicious looking food, too! I hope your Spring is going well! You present lovely posts! I came by to tour your garden but according to your about page this is more of a food blog now. I enjoyed your photography of your delicious meals. I will have to stop by when I need a tasty snack or feast for my eyes.